Lake Chelan, a photo by Southworth Sailor on Flickr. So far we have escaped Alzheimer's, so we don't have to worry about one of us taking Pat Robertson's advice! We celebrated our 34th wedding anniversary with a weekend in Leavenworth and Lake Chelan. Part of our agenda this weekend was to scout out a good getaway spot for our family summer outing next year. We stopped at Suncadia near Roslyn and checked out the resort facilities. Then it was off to familiar Leavenworth for shopping, dining and relaxing in our room with a view. Esther found a new home decor item and I found a pair of hiking boots on sale. (My twenty year old boots from Goodwill are going in the dump!) I also found a good book about cycling. 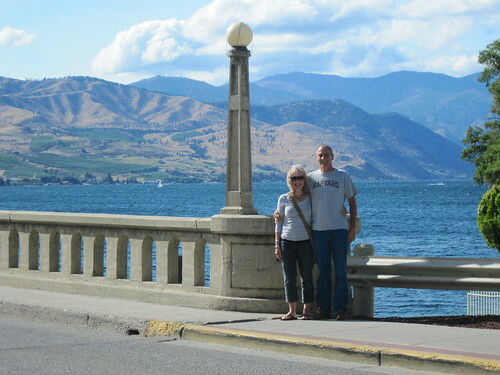 On Sunday we went up to Lake Chelan to explore a couple of resorts and enjoy the town. We found a couple of possible spots that would suit the family. We'll have to see about availability. We escaped the rain, and Chelan was sunny, though quite windy.